All your kids' belongings will come back home safe and sound with extra durable kids labels. These unique, colourful, self-laminating labels are extra durable and will stand up to kids. All your kids' belongings will come back home safe and sound with extra durable kids labels. These unique, colourful, self-laminating labels are extra durable and will stand up to kids. 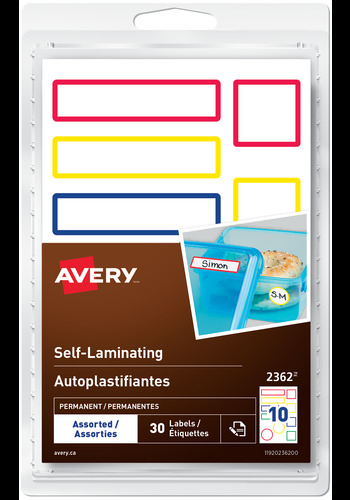 Self-laminated labels are permanent, easy to apply and perfect for use on lunch boxes, toys, electronics, plastics and more. Easily identify items by simply writing on the label with any permanent marker, seal label with attached laminated overlay, and stick onto your items. Avery® kids labels are waterproof, dishwasher and microwave safe! Never lose kids' items again with a label that's built for them. Kids Labels are an Extra-Sturdy material that resists water and tearing. Make sure your kids can always find their items with these versatile, writeable labels. Labels are perfect for labeling daycare, school and camping gear, lunchbox items, sporting goods and more.